Estoppel is a doctrine of law to prevent or bar some assertion of fact or law by party. Estoppel applies when two statements present a contradiction with the result that the earlier is taken as the truth. An application of the doctrine prevents a defendant setting up the true set of facts (namely represented by its change of position), and force the defendant to accept the set of facts as represented by him. Therefore, estoppel precludes a person from asserting something contrary to what is implied by his or her previous action or statement or by a previous judicial determination concerning that person. 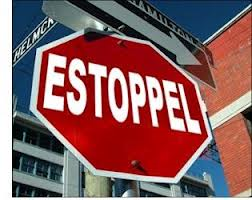 Estoppel is essentially a rule of evidence whereby a person is barred from denying a fact that has already been settled. The plea of estoppel is closely connected with the plea of waiver, the object of both being to ensure bona fides in day-to-day transactions. Under this kind of estoppel, a person is not permitted to dispute the facts upon which a judgment against him is based. It is dealt with by (i) Ss. 11 to 14 of the Code of Civil Procedure, and (ii) Ss. 40 to 44 of the Indian Evidence Act. Under this kind of estoppel, where a party has entered into a solemn engagement by deed as to certain facts, neither he, nor any one claiming through or under him, is permitted to deny such facts. The doctrine of estoppel by deed (also known as after-acquired title) is a particular estoppel doctrine in the context of real property transfers. Under the doctrine, the grantor of a deed (generally the seller of a piece of real property) is estopped (barred) from denying the truth of the deed. The doctrine may only be invoked in a suit arising out of the deed, or involving a particular right arising out of the deed. If a man, either by words or by conduct, has intimated that he consents to an act which has been done, and that he will not offer any opposition to it, although it could not have been lawfully done without his consent, and he thereby induces others to do that from which they otherwise might have abstained from doing, he cannot question the legality of the act to the prejudice of those who have so given faith to his words, or to the fair inference to be drawn from his conduct. 1. Tenant (Section 116): No tenant of immovable pro­perty (or person claiming through such tenant) can, during the continuance of the tenancy, be permitted to deny that the land-lord of such tenant had, at the begi­nning of the ten­ancy, a title to such immovable property. 2. Licensee of a person in posse­ssion (Section 116): No person who came upon im­movable property by the licence of the person in po­ssession thereof can deny that such person had a title to such possession at the time when such licence was given. 3. Acceptor of a bill of exchange (Section 117): No acceptor of a bill of exchange can deny that the drawer had au­thority to draw such bill or to endorse it; but he may deny that the bill was really drawn by the person by whom it purports to have been drawn. 4. Bailee or licensee (Section 117): No bailee or lice­nsee can deny that his bailor or licensor had, at the time when the bailment or lice­nce commenced, authority to make such bailment or grant such lice­nce. But, if a bai­lee delivers the goods bailed to a person other than the bailor, he may prove that such person had a right to them as against the bailor. The doctrine of estoppel does not apply to statutes. In other words, a person who makes a statement as to the existence of the provisions of a statute is not estopped, subsequently, from contending that the statutory provision is different from what he has previously stated. A person may not represent the true status of a statute or law, but the other person who relies on such a representation is at liberty to find out the position of law on the matter and as the maxim says, ignorance of law is no excuse. So a person can not take recourse to the defence of estoppel to plead that a false representation has been made regarding the provisions of a statute or law. The principles of estoppel can not override the provisions of a statute. Where a statute imposes a duty by positive action, estoppel can not prevent it. The doctrine cannot also be invoked to prevent the legislative and executive organs of the Government from performing their duties.